Even though the days of radio hams building their own transceivers is largely behind us, completing a project or constructing something genuinely useful for yourself can be hugely rewarding and add to your skillset. 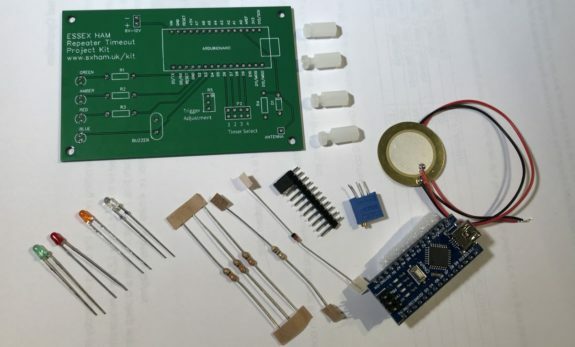 On this page, we’ll look at an easy construction project that serves a useful purpose for repeater users, and helps get newcomers ‘hands-on’ with a fun construction project. 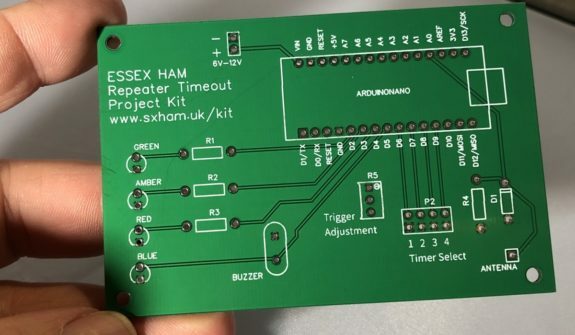 This kit has been designed by Essex Ham member Andrew M0ONH, following on from discussions on Essex Ham’s Monday Night Net about the idea of a timer to alert net participants when they were approaching the local repeater’s two-minute timeout. 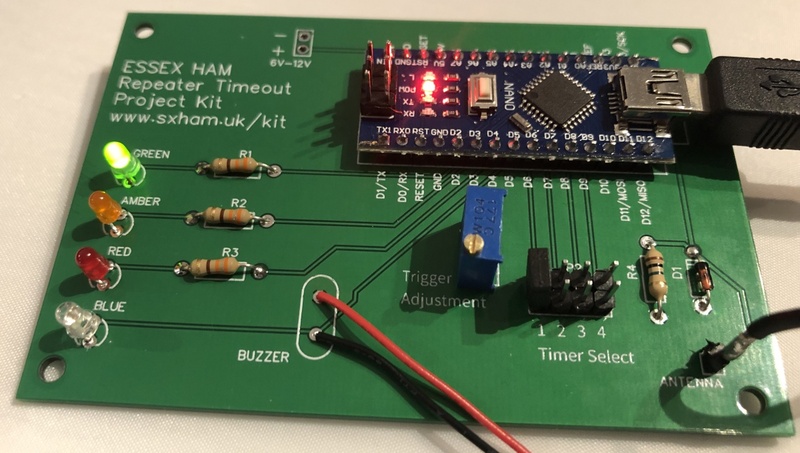 The kit makes use of the popular programmable Arduino Nano board and some basic components to detect when you key up, time the length of your over, and alert you audibly and visually when you’re about to time out. This is a fairly easy kit to put together, and the review version that we were sent contained a detailed set of instructions, including practical tips on the best way to assemble the kit, with some useful tips for the first-time constructor. At the time of writing, there are a couple of versions of the kit available – one that uses an Arduino Nano board (featured in our video), and one that uses an ATMega328p microcontroller (the chip used on Arduino boards). The two versions work in the same way, but the boards and the instructions do differ slightly. The kit contains the printed circuit board, a pre-programmed Arduino Nano (or the chip itself), plus all of the required components. Tools required to construct the kit are: soldering iron and a pair of wire cutters, and you’ll need a length of thin equipment wire to act as the antenna. You may want to make, buy or 3D print a case too. The kit is powered either by 5V (by connecting a Mini-B USB adapter direct to the Nano), or from any 6-12V power supply. In summary, it’s a fun kit to build, and for repeater users, a handy way of preventing pesky repeater timeouts. Well worth a look, and supplied at a decent price too.